Trademark law enables businesses to establish, protect and profit from a distinct, recognizable identity of a product or service. 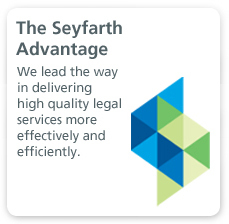 At Seyfarth Shaw, we work with clients at every step of the trademark development process, from creation, identification and protection, through licensing and prosecution of trademark infringement. The broad experience and in-depth knowledge of our trademark attorneys allows us to provide comprehensive, creative legal counsel that helps clients to achieve their trademark-related objectives, to build, maintain or grow the reputation that those marks represent, and to defend their investments against competitors' claims. Seyfarth Shaw’s Trademark Prosecution team helps our clients create, protect and profit from their unique positions in the marketplace by developing distinct, recognizable identities for their product or service. Our team works with and understands the business realities facing clients ranging from multinational corporations to cutting edge start-ups, handling both U.S. and non-U.S. trademark matters with regard to trademark assets ranging from brick-and-mortar products to those that are solely web-based. Our trademark attorneys have handled the preparation and prosecution of thousands of trademark applications around the world, and we are counsel of record for the owners of many well-known trademarks and service marks. 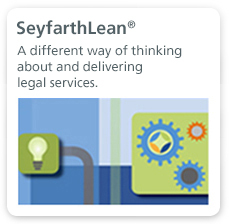 As part of Seyfarth’s overall focus on streamlining processes for our clients and reducing legal fees, we have developed an online matter tracking, reporting, and document management tool that we apply to global trademark prosecution and portfolio management. We pride ourselves on delivering prompt, practical, and experienced-based advice from seasoned practitioners and in prosecuting trademarks in a cost-effective, results-oriented manner. 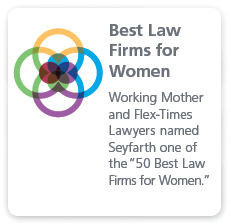 Seyfarth Shaw’s multi-office Trademark Litigation team helps our clients protect and maintain their hard-earned unique positions in the marketplace through its business-oriented approach to trademark, false advertising and unfair competition litigation. Many of the members of the team both prosecute trademark applications and litigate trademark disputes, thereby bringing to bear substantial experience ranging from clearance to licensing to protection. We find that this cross-disciplinary approach provides our clients with robust advice regarding when and how to address potential infringement as well as the issues that arise when such disputes are litigated. We have litigated trademark issues for clients ranging from multi-national corporations to cutting edge start-ups. Seyfarth’s Trademark Litigation team has a proven record of success in obtaining temporary restraining orders, injunctions, and seizure orders in cases where every hour is crucial to the client’s bottom line. Consistent with our client-focused strategy, these avenues often result in early settlement and less costly outcomes. Seyfarth earns “Standout” honors in IP Litigation in BTI Litigation Outlook 2015, the latest report from BTI Consulting Group.